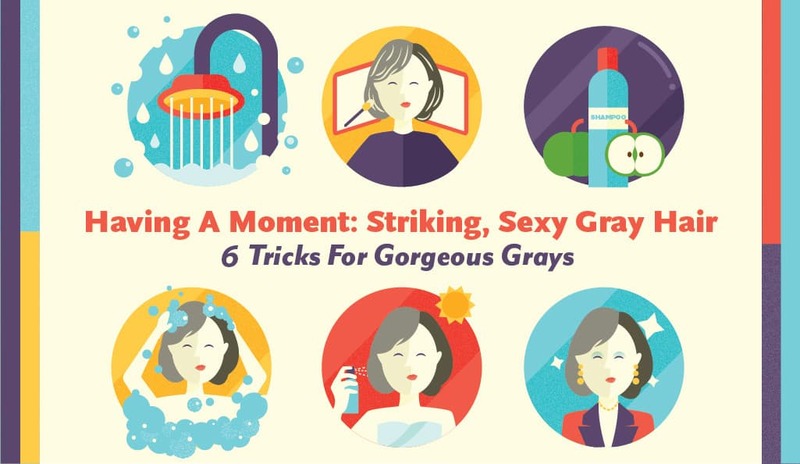 By the looks of hair color commercials, your favorite magazines, and the most touted beauty advice, we’re supposed to do one thing to our grays: cover them up. But why? Age-related pigment loss is an inevitable reality, but it’s also a sign of experience, wisdom, and pure confidence. If only it were so easy to let it all go—just surveying your group of girlfriends is enough proof that everyone’s grays come in differently (some more graceful than others). If you have ever considering letting your grays start coming through, or taking the plunge to a striking all-silver ‘do, consider this list—along with an expert colorist—your guide to the most gorgeous hair of your life. HOW HEALTHY IS YOUR H2O? For the shiniest silver hair there ever was, be aware of the water you are washing your hair with says Frank Friscioni, Co-Color Director of Oscar Blandi Salon in NYC and Owner and Partner of Frank Cassi Beauty in Palm Beach, Fl. “Depending on where you live, the water can be hard or soft and contain a mixture of elements and minerals,” he says. and “Certain waters can dull out the gray and make it yellowish.” Your best bet? Grab yourself a purifying shower-head (like T3 Source Shower-head Filter, $130 at Sephora.com). If your grays are coming in, you know this much is true: natural gray hair is actually a multitude of tones ranging from rich steel all the way to bright white. So if you are dying your hair or want to fill in the blanks around your grays, swap one all-over color for dynamic, multi-Tonal highlights, suggests Friscioni. You will achieve incredible texture and depth, while making everyone else do a double take. When you go for those highlights, however, you should choose wisely. Highlight color choices should stay in the cool family of colors, staying away from any warm, brassy, or red tones! “They will interfere with the attractive salt-and-pepper look that everyone seems to want,” Friscioni says. If days of mousse, hairspray, and dry shampoo have left your strands with a lot less luster, go the DIY route and, once a month, consider using apple cider as shampoo. “It will take the build-up and residue off of the hair strands while brightening it up,” says Friscioni. Yep, we said it. Silver shampoos aim to neutralize brassy or yellow tones and make every shade of gray sparkle. 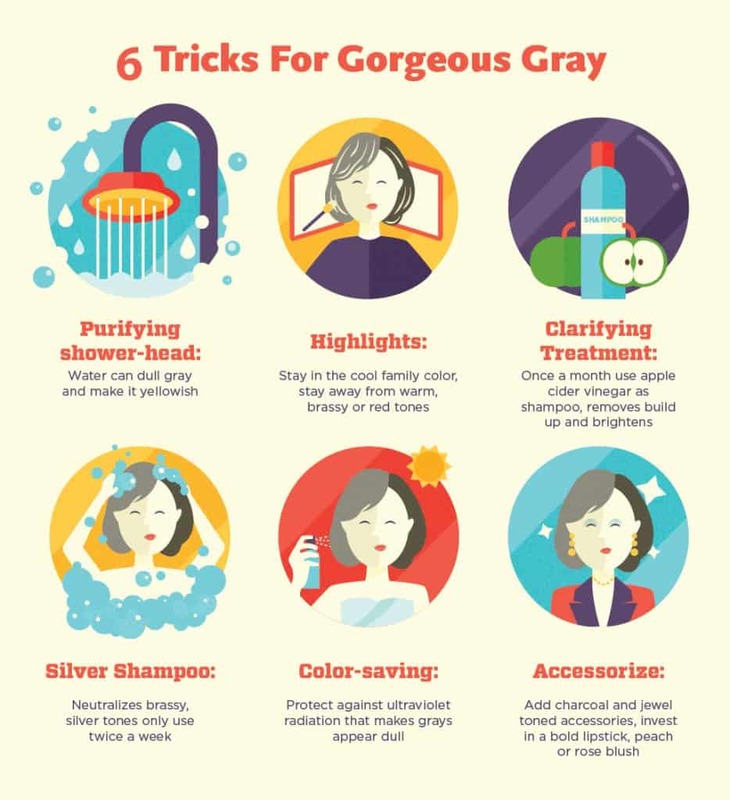 Just be sure to keep this new beauty habit to twice a week—silver shampoos can overgrab and leave you with a bluish ‘do. Try Matrix So Silver Shampoo ($9, Walgreens). 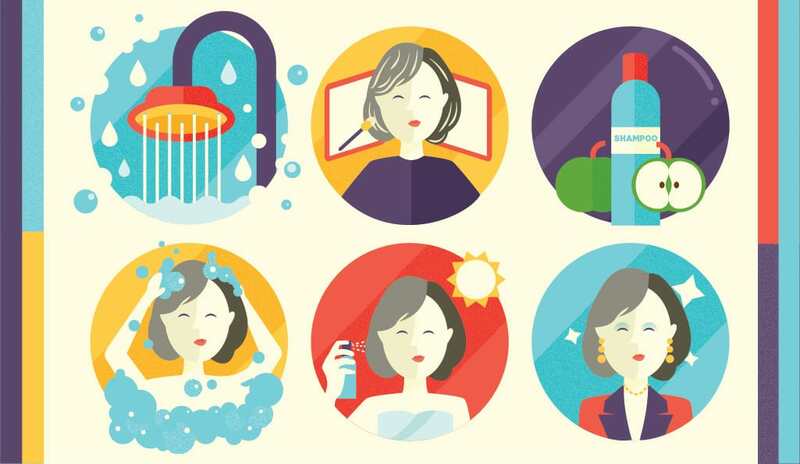 Ultraviolet radiation and environmental pollutants can make any hair color—from the richest reds to the most neutral grays—appear duller, faster. Choose a color-saving shampoo rich in antioxidants (like Garnier Fructis Color Shield Shampoo $4, drugstores) and give your grays a spritz with a leave-in UV protectant spray (like Ouidad Sun & Sport Leave-In Conditioner) to help keep the elements out while you enjoy a little sun time.